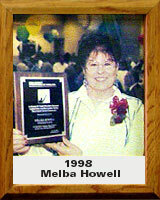 Melba Howell, an accomplished bowler with ABC/TWBA, achieved championships in state and city tournaments from 1952 through 1973. She held the high average in city league tournaments for several years and was Team Champion from 1955-1958 and again in 1961, 1964 and 1971. For several years, Melba served as Secretary/Treasure and Coach for Bantam Bowlers (Youth) at Lucky Strike and Tucson Bowl and coached Junior Bowlers (Youth) at the Copa Bowl. She also served as TWBA Publicity Chairman and on the TWBA Executive Board.